What happened to the definitive comparisons? The answer is, the bullets from the apartment didn't compare to those from the shooting site. This would mean the comparison between E14B which has extractor marks close to the ejector marks does not match with E3, E4A, E4B, E5, E6A and E6B because their markings, which are at 3 o'clock and 8 o'clock are not close together. No lab reports are available and no one testified on these extremely important gun powder tests. If the gun powder from Diane Downs' rifle had matched that of the gun powder residue from that night, you would have heard about it, but you didn't. The bullets taken from Diane's apartment did not match the bullets from the shooting site, because the gun powder didn't match. Now look what happens, the bullet that was taken apart is no longer E14A. Look at the diagram below. It shows E14A intact and E14B disassembled. What were they drinking anyway? In John Murdock's notes he also makes a comment about a problem with E14B and it's comparison to E3. He says: "A reason has caused me to reconsider the id - it seems to fall apart at 4x the object...: He also said Jim Pex "made some tests wherein he caused marks to be made on base of test cartridge" Could someone tell me why they were making marks on other cartridges? See: Murdock's notes page 955.pdf You can also see he's out of time. "No photo. No time." On June 28, 1983, photos were taken of the comparisons between the casings involved in the shooting and cartridges "found in Diane's rifle". The casings (empty cartridges) from the shooting site, and the two lead cartridges, (bullets are intact) allegedly taken from Diane's rifle at her apartment are listed below. Each label , E3, E4A, etc. is the label used by Mr. Murdock and is identified where it is found. You've probably already figured out that all the casings from the car and the road must match. 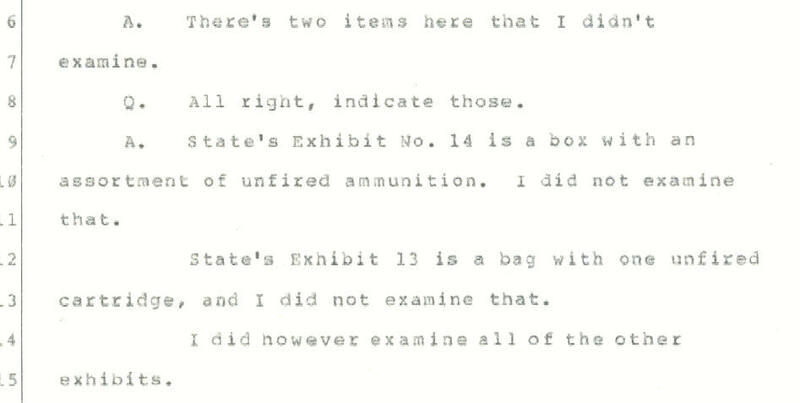 Comparatively speaking, the two cartridges allegedly taken from the rifle in Diane's apartment must also match. Now watch what happens. The headers help to direct your attention. Note: Four casings were found in the car and two were found on the road. The casings from the car and the road have to match because they came from the same weapon. The two from the rifle must also match. They are from the same weapon. Now, look at the comparisons of these empty casings to the cartridges from Mr. Murdock's notes: Remember E3, E4A, E4B, E5, E6A and E6B all came from the shooting site. They have to match. E3 and E5 don't match, but they're both out of the car. They have to match! 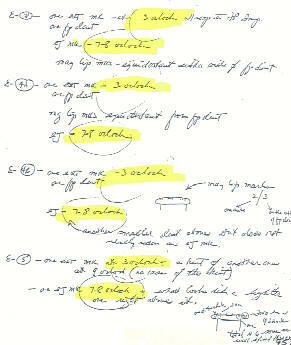 In Mr. Murdock's notes he labels each casing taken from the car and the road with identical markings: "One ejector mark at 7-8 o'clock one extractor mark at 3 o'clock." 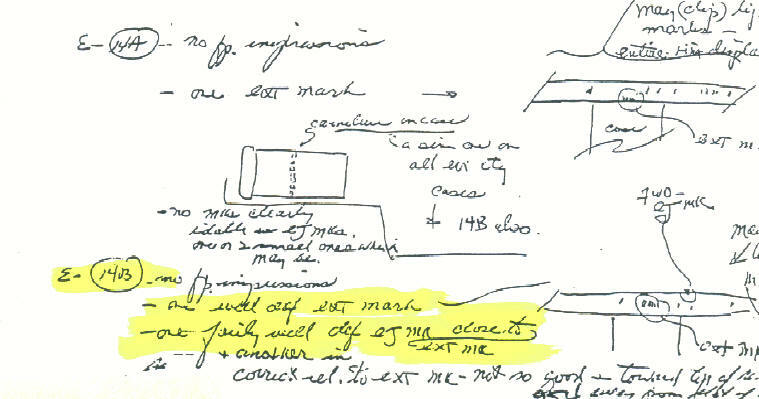 In those same notes, the two bullets allegedly taken from Diane's apartment are labeled: "E-14A one extractor mark (no location) E-14B one well defined extractor mark - - one fairly well defined ejector mark - close to extractor mark (no location)." E3, E4A, E4B, E5, E6A, and E6B all have to match because they are empty casings that were found on the road or inside the car and all came from the same weapon. Makes a little more sense doesn't it? There is definitely a problem with Mr. Murdock's comparisons. However if you look further, you will find that Mr. Murdock didn't work alone. If these were blunders, there were at least two people making the mistakes or one person making deliberate mistakes and not telling the other. NO comparisons were made between the lead cartridges, E14A and E14B and distinctive markings made by the rifle itself. Making the comparison in this way, the ballistics from the car and the road do not match the ballistics of Diane's rifle. E3 and E5 must match, they are from the same weapon, and the marks they carry are deep enough to compare. They don't. E 14A and E14B must match, they are from the same weapon. They don't. E3 and E14A (E14B) carry marks the rest don't have, "Unique marks"! This comes directly from Murdock's report, "A reason has caused me to reconsider the ID, (between E3 and E14B) it seems to fall apart at 4 times the object. I told Jim Pex that this possible association could be studied further...". (June 28, 1983) "No photo. No time." A day earlier, "On E14B, no extractor mark deep in the rim and not able to identify extractor mark present with E3." Yet a day later, every single comparison was made with E14B. What happened in the Lab overnight that caused this man to change his mind? Was there a double switch? E14A becomes E14B and vice-versa, then E14B becomes E3. In court, Mr. Murdock testified: "I made a rather detailed series of notes." (Transcript page 1348, lines 16-17). For this reason I find it easier and more dependable referring to the notes he took at the time of the examination of the casings and cartridges, rather than to his memory of two months or even a year later. Mr. Murdock swore under oath, "Exhibit No. 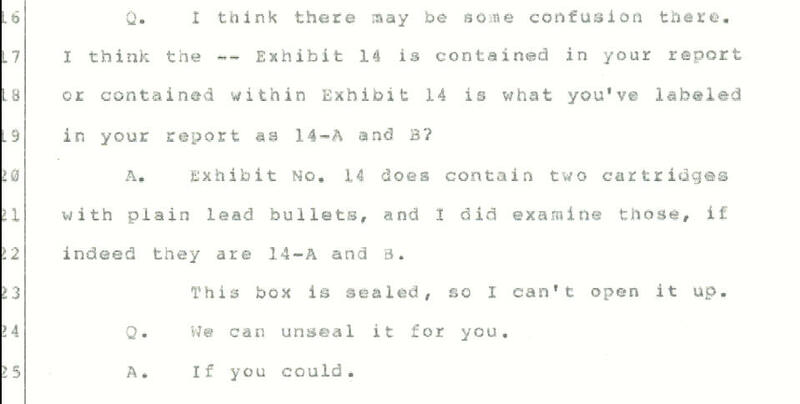 14 does contain two cartridges with plain lead bullets, and I did examine those, Yes, these appear to be items 14-A and B." (Transcript pages 1347-1348). The problem with that memory is that on page 933 of Mr. Murdock s detailed written report, he noted that one of the lead cartridges was taken apart to retrieve the gun powder inside for tests. There is no possible way E14B could be in cartridge form one year later for Mr. Murdock to identify. One of those cartridges should be a casing. Again, Mr. Murdock swore, "And I found extractor marks on these two unfired cartridges which were found to agree with the extractor marks on the six cartridge cases that I've just described, and the agreement was sufficient to allow me to conclude that the same extractor made the mark on all six cartridge cases and the two unfired cartridges from the tubular magazine of the rifle." (Transcript Page 1350, lines 11-17) There are two VERY serious problems with that statement. First, as you just read, E14B did not match E3, E3 did not match E6B and E3 did not match E5 with respect to extractor marks. (Mr. Murdock's notes, page 948) How could Mr. Murdock swear before the jury that every extractor mark on every cartridge and casing matched all the others? They didn't. "Tell me what you want and I'll get it for you." His answer to the earlier question was: "Exhibit No. 14 does contain two cartridges with plain lead bullets because one had been taken apart." That creates a problem. And the problem is: There could not have been two cartridges in that box because the bullet and powder had been taken out of one of the cartridges. Read a little further, you will find that (14 A) had been taken apart to get gun powder. Guess what! The gun powder didn't match and the bullet was no longer intact. They wouldn't let something as vital as that get by them, but they might try a little snow job because no one will ever expect it. On June 27, 1983, a month after the shootings, John Murdock, Director of the Contra Costa County Laboratory in the Sheriff's Department in Martinez, California began his comparison of the ballistic evidence. He started by evaluating each piece of evidence, bullet, casing, or cartridge. (The bullet is the projectile, the casing is the empty cartridge, and the cartridge is the bullet and casing totally intact with the gunpowder inside.) Mr. Murdock would then establish the validity of each piece. This, according to his notes, involved noting the degree or depths of each tool mark in regard to actually being able to make literal comparisons with other such evidence. He lists each identifying number, such as E3, E4A, etc., with the corresponding tool marks as, one extractor mark at 3 o'clock and the ejector mark at 7-8 o'clock. All casings from the shooting site (the road and the car) were exactly the same, extractor mark 3 o'clock, ejector mark 7-8 o'clock. The cartridges allegedly taken from Diane's rifle are listed in a glaringly different manner. E14A is noted to have one extractor mark and no clear ejector mark and E14B is listed as well defined extractor mark and one fairly well defined ejector mark, "close to the extractor mark," The description changes. . It's not 3 o'clock and 7-8 o'clock, but now it's "close to extractor." It's double talk. They don't match!! !